A few images from Dunham Massey, a National Trust property in Cheshire. These were taken on 19th February – just at that time of the year for us in England where the spring flowers are arriving, heralds of joy and new hope. Cover Reveal for Relaunch of Mystical Circles Coming Soon! Posted on July 18, 2017 July 17, 2017 Categoriesa passionate spirit, book reviews, Books, British, British landscape, British psychological suspense writer, creative writing, life, literature, love, Mystical Circles, New psychological thriller fiction, paranormal thriller fiction, Perilous Path, psychological suspense fiction, SC Skillman, SC Skillman Author, UK, WritingTagsavailable to pre-order, blog, cover reveal, design, new, new edition, publication date, reviews, SC Skillman, thriller suspense novel4 Comments on Cover Reveal for Relaunch of Mystical Circles Coming Soon! Exciting news! Mystical Circles, the prequel to A Passionate Spirit, will be relaunched soon by Luminarie. I already have the new cover design and it’s very exciting indeed! I love it and I hope and believe you will too. 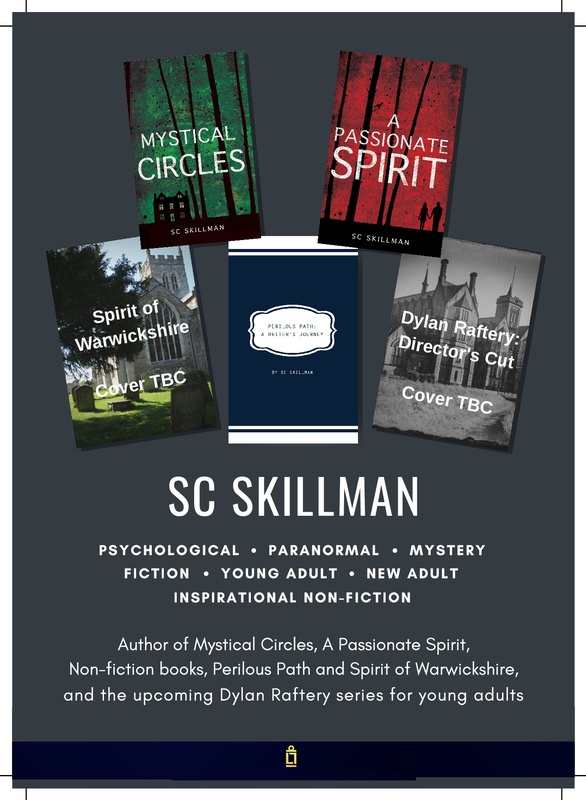 The new cover will express a much darker mood, as does the cover design of A Passionate Spirit, with some significant variations… this will update the branding of the two thriller suspense novels which explore strange and paranormal happenings in the same idyllic Cotswold location… a beautiful manor house in a hidden valley deep in Gloucestershire. Watch this space – the brand new edition with its fabulous new cover will be available to pre-order on 1st August. And that’s the day when I’ll feature the Cover Reveal on this blog. The publication date is 5th September. Also out on 5th September from Luminarie will be the new edition of Perilous Path: A Writer’s Journey. This is my inspirational writer’s guide, packed full of helpful and encouraging tips, insights and reminders for writers. Both these Luminarie editions will be available to pre-order on 1st August when I’ll have the cover reveal of Mystical Circles edition 3 for you. And if you haven’t already ordered your copy of A Passionate Spirit, get the paperback here . And here‘s where to get the ebook.